Every mile driven by the vast majority of all vehicles in the world slowly eats away at our collective reserves of oil. Combine that with the use of oil in the manufacture of plastics and the burning of oil for electricity to create a gnawing need for the stuff that suffuses every aspect of the world economy. Though there has been research into getting away from such a bewildering reliance upon a single substance, both here on earth and among the stars, the overall consumption of oil refuses to let up, showing that those who have the skillsets required to find and harvest new sources of oil from deep within the earth will have stable work for the foreseeable future. The extraction of oil is a very labor-intensive process. Geologists, chemists, and engineers work together to find the best locations for the acquisition of oil and design the right platform for that particular location. Now that the easy-to-access oil deposits have been tapped by our ravenous appetite for the stuff or are protected by politics and conservation efforts, a large number of the new oil wells going up seem to need something special to do their jobs to the fullest. This complexity does not cease with the construction of the site and spills over into the day-to-day operation performed by oil and gas workers. The expectations of the oil and gas worker differs depending on that individual’s specialty. Derrick operators are responsible for the smooth operation of the hardware that does the actual drilling. To that end, the hole drilled by the derrick is their primary concern. Their duties revolve around ensuring that the hole is drilled straight; that the drill does not become stuck; and that the drilling fluid, also known as mud, keeps flowing properly. Also known as simply drillers, rotary drill operators focus on the drill itself. The primary source of interpretation of the plan sent down by the engineers, the rotary drill operator focuses on both the methodology of the rig and the wellbeing of the heart of the rig: the drill. It is the driller who adjusts the drilling cadence of the drill based upon output from various dials and other readouts available to the team. Though every member of an oil derrick team can bring about the downfall of the rig with one false move, the rotary drill operator’s mistakes are arguably the most costly. Whereas derrick operators maintain the drill and the hole drilled by the drill, the roustabout is the jack-of-all-trades who is capable of doing everything. Ostensibly responsible for the piping to oil storage and wastewater disposal tanks, the roustabout is also skilled in the maintenance of absolutely everything on the field and can work as a standard well operator, or pumper, on demand. Such is the roustabout’s ability to be a jack-of-all-trades that even the role of the mud chemist can be taken over for a period of time. This may be part of why a 2010 survey named the roustabout the worst job in the United States. Service unit operators are interested in the optimization of oil flow from a well or wells. To this end, the service unit operator is responsible for the removal of any obstructions in the well itself, as well as the actual operation of pumping and drilling apparatus alongside the derrick operator. 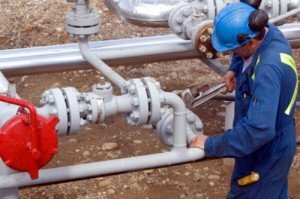 In order to become an oil and gas worker, an applicant must have a high school diploma; however, there are vocational schools that allow the student to complete a high school education while focusing on training in a particular profession. These include institutions like Penta Career Center, which serves a five-county area in northwest Ohio. Hiring from such a pool is preferred by the oil and gas industry, as there are a number of practical skills, such as welding and the operation of heavy equipment, that need to be internalized before letting an individual loose on an oil rig is anything but a bad idea. Given the multitude of things that the successful oil and gas worker must know in order to achieve this success, the oil industry is known for clinging onto those it has trained and offering them good work with clear advancement in a number of branches. Those who enjoy the physical work will find rewarding careers as the bosses of oil rigs, calling the shots as if it were a personal fiefdom. Those with the abstract knowhow can quickly find themselves made engineers and mud chemists, though college degrees or some other proof of abstract training is required for this to work properly. Still, others can find themselves in business administration, where experience on the wells is actually of use in the determination of the policy of those wells. In short, unlike many other career paths, advancement through the oil industry is a complex web of possibilities instead of a narrow track and features many opportunities to make sweat, blood, and tears worth it. For those who stand out as hard workers among other hard workers, the oil industry will deliver the preferential advancement that such personalities tend to crave.